Okay, so I have a post in my draft folder with only a title. It's called, "I'm not giving up on my goal!". But instead of writing it, maybe I will just link to YOUR post because I could have written most of it about myself! 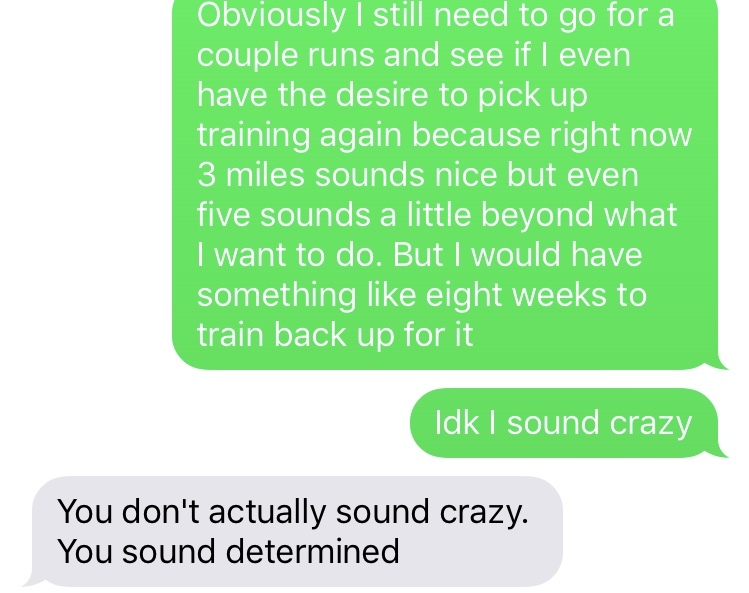 I am also considering another race sooner rather than later, but I don't want to be hasty and do too much too soon- especially because I told myself I would CHILL for awhile after BDR. I know where you are coming from. You are not mad. Starting from scratch sounds harder than just going for it sooner. Same with me. Last weekend could have just been a really good training run in the grand scheme of things, you know? I was scared to put a lofty goal out there too, then to admit I missed it by quite a lot. But now I am no longer afraid of just admitting to my "A" goal because admitting I failed ended up not being that horrible. I didn't beat myself up over it too long either. I know the side stitch and calf cramps in a WAY could have been out of my control, but if I had hydrated better and had more salt, maybe that wouldn't have happened. And hydrating, etc is definitely IN my control. I don't know. HA! I guess we really are in the same boat. BDR was not our weekend. But yes, in the grand scheme of things, it DOES feel like it was just a really good training run. I do think it's invaluable that we learned to give up the fear of setting goals publicly. That's such a huge step for both of us, and it's VERY freeing! I think the lessons we took away from BDR ALMOST make the setbacks worth it haha. I agree! We learned a lot! I have a quote outside my classroom on a music stand that says something like "Masters have failed more than the beginners have even tried". I don't think you're mad, I think this is a normal reaction. I am already thinking about late May/June marathons I can do if something goes wrong at Pittsburgh and I want another shot. When you were prepared for a good time and didn't get it because of circumstances outside your control, it's hard not to feel like all that training was wasted and you might as well try to get something out of it. There's no right or wrong answer here, as long as you play it safe and understand what you're getting yourself into, which it sounds like you do. I know that personally if I were to do a redemption marathon I'd do another one in the same season. No way I'm going through another whole training cycle. That's exactly what I'm thinking - that training in the same season will be easier than having to go through an entirely new cycle next time. I'm glad I'm not the only one who plays around with this idea. I like that you already have a backup plan for Pittsburgh just in case. I actually don't think you're mad either. My first marathon went down the toilet, but that was because of muscle cramps. Probably caused by my own personal panic attack and inadequate strength training plus insufficient race experience. In other words, not stuff that can be fixed in 8 weeks. You had a tough race primarily because of heat. I'm not at all surprised you are thinking about trying again. Be sure you are really and truly recovered if you decide to go for it and think hard about what outcomes are acceptable and whether they are worth the risk. 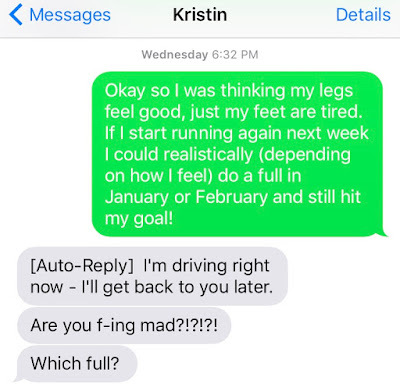 I have a friend who missed her BQ by 30 seconds a few years ago. She raced again about 6 weeks later and missed by over 2 minutes. I don't think she has tried again since then, though she's done lots of other great stuff and a BQ is not a necessity for a happy life, by a long stretch. I do wonder what might have happened if she had waited 6 months to try again, instead of 6 weeks. But, I totally get where you're coming from and personally, I would be incredibly tempted to go for it. I think you raise a couple of REALLY good points. If I rush back into this, I could end up with another setback and weighs more heavily on my confidence in the long run. I'm definitely going to listen to my body and my desire - this has to be about what I want, not about punishment or something like that. Thanks for your insights Sarah! I'd say if you're feeling a wave of motivation, of any sort, ride it. YOU DID NOT FAIL!!!!! You didn't meet your goals, but you finished a freaking second marathon! You are allowed to be disappointed, but you are NOT allowed to feel badly about yourself. Big difference!! Definitely like your attitude about getting "back in the saddle". Sounds like you are determined. That's what is important. It is not significant that you fell short of your goals. In life, everybody will stumble now and then. What matters is what you do afterward. Go for it - but proceed with measured caution. And don't be upset if somewhere along the way something happens to put a halt to your plans. No matter whatever happens, don't let yourself ever be devastated by your performance in a race. There are much more important things in life. Go girl!!! I'm going to look into the Higdon MM plan!! Thanks for the tip! 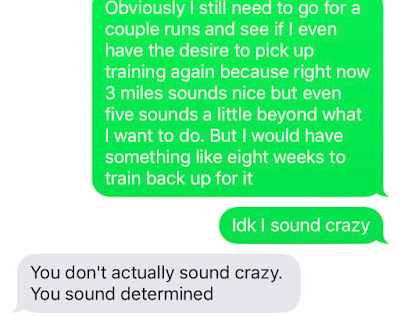 I'm in no position to give anyone advice about marathon running, but I definitely don't think you're crazy at all. It seems completely realistic to think you could upgrade A1A to the full marathon. I know you'll listen to your body and do whatever is the right thing for you. I would say that it's possible that it'll be just as warm at A1A in February. I know we had pretty nice weather last year in February for the race, but we also had fairly nice weather in November/December last year too. I was just looking at my training log from last year and was surprised to see how many times it was in the (upper) 60s at night/in the early morning during my runs in Nov & Dec. I've been told that the weather is actually supposed to be cooler this Jan/Feb since we've had such a warm winter so far which could mean really good things for both of us at A1A! I definitely don't think it will be hotter than Cape Coral was and that's definitely a plus! A big plus! I was so so so impressed with your performance at Cape Coral. I saw so many athletes reduced to a slow walk, so many looking totally defeated by mile 24, and you still looked so strong. I'll never forget it! The heat is the #1 thing I'm keeping an eye on. There's no point in me trying again so soon if the weather won't cooperate - I don't want to a repeat of BDR! I'm hoping the race organizers will let me change my registration last minute if necessary, but I haven't even heard back from them yet on how upgrading works. I don't think you're crazy at all. I would say go with what feels right. 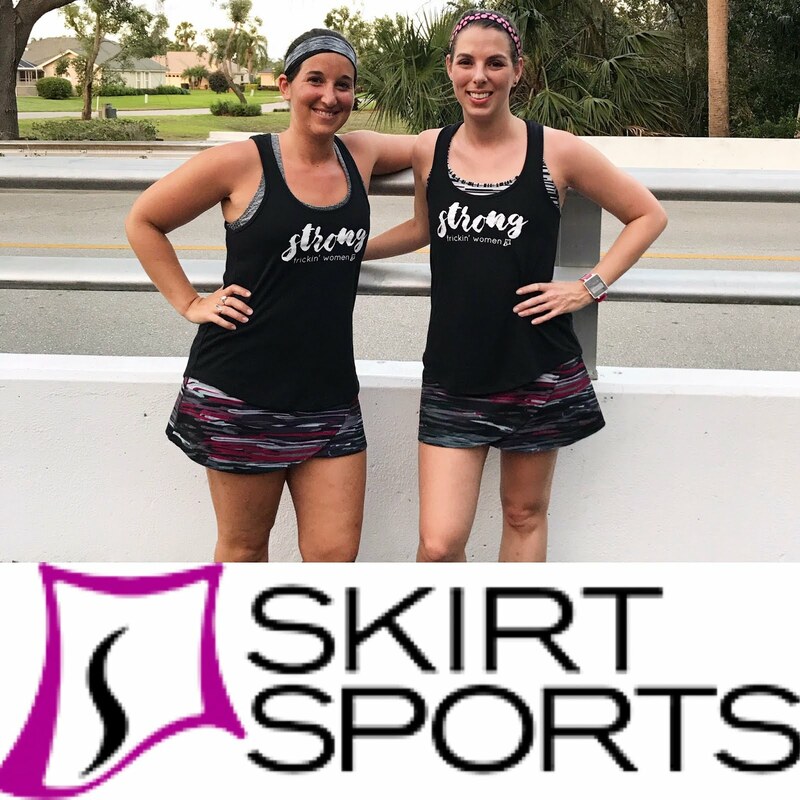 I've chosen smaller races to "prove myself to myself" after a disappointing race (for factors out of my control), but I certainly see the attraction to getting another marathon in! The only thing I would say is YOU DID NOT FAIL! You finished, yes? To the best of your ability, yes? Then you did not fail. I think I won't be publicizing this marathon much. I told Matt I don't want to make a big deal of it - if I run it, great. If I don't, okay. We'll see how things go. As for failure...I had this debate on my FB wall when I shared this blog. I don't think failure is a bad thing; I know it may sound harsh to say "I failed", but I'm really okay with that wording. I think failure is an important step to success; every historical GREAT faced major failures in his/her time. We have to stop thinking of failure as a crippling negative when really it's often the boost we need to rethink and redo. I preach against the negativity of failure in my classroom, so I really feel like I need to embrace the term on MY terms in my own life, too. I missed my half marathon goal by a bit over a minute this fall. That night, I created a new plan and started immediately. I had run 3 halved in preparation, so I wasn't worried about the recovery. But mentally, I wasn't ready. I was anxious and frustrated. Suddenly running become a lot less fun. I decided to scratch my plan (will still be doing the half next week) and focus on something different for a bit. But I know plenty of people that keep their mileage up, so that they can run the distance again quickly. If it's fun and nothing hurts- go for it!